Originally written for HULIQ.com and published on their site. Frank Lloyd Wright. Minoru Yamasaki. Albert Kahn. Mies Van Der Rohe. These are just a few of the internationally-acclaimed architects with real estate masterpieces in Detroit, MI. I fondly remember riding in the subdivision where I grew up and passing a funky-shaped home with seemingly endless rows of windows, not knowing in my youth the home was designed by an iconic real estate legend, Frank Lloyd Wright. With such a rich history, it has been disheartening to watch the degradation of home values in Detroit, once known as the "Paris of the Midwest" and where I called home for more than half of my life. Prior to the recession of 2007 and around the recession of 2001, I and many of my high school and college classmates (i.e. those of us that sit right on the dateline between Millennials and Gen X) had abandoned Detroit for what we thought were greener pastures. I, along with many, moved to the South's up and coming "Be-ve-ly... Hills, that is" (Atlanta, GA) and several others to Dallas, TX. Did those of us that shipped out of Detroit, MI (or rather those of us that were "imported from Detroit" as Chrysler's commercial spins it) truly land in greener pastures? Of course many of us may shout from the hills, "YES!" 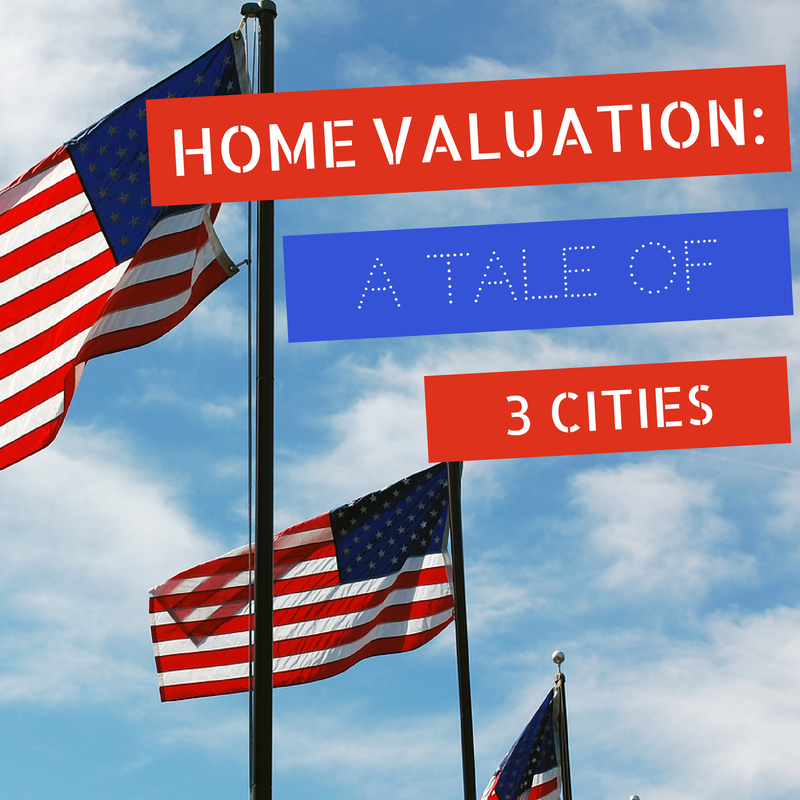 but I was surprised by the data I found on home valuations since 2002 for all three cities. Because of the gravity of what us older Millennials have learned, I want to give Millennials that are striking out to become homeowners food for thought so that they avoid the mistakes we made. We all seem to magically have 20/20 vision in hindsight and since history has a odd way of repeating itself, maybe my story does not have to be yours no matter your locale. Source alert: I am a fan of the S&P/Case-Shiller Home Price Index so you guessed right if you noticed that the following observations came from their reports. In July 2002, at the point that I and many of my classmates were transitioning to or settling into our new cities, Detroit's home valuations was shockingly better than (although only by a smidgen) Atlanta and Dallas. I actually do recall that being the case in Atlanta because I remember remarking how "cheap" metro Atlanta homes seemed to be compared to metro Detroit as a new Georgia peach in the summer of 2002. Detroit would keep its lead for more pricey homes through June of 2004 at which point Atlanta began to trump Detroit for more costly homes, with Dallas still allowing homebuyers to get the most bang for their buck comparatively. I purchased my first real estate property in December of 2004 and I recall complaining to my parents how expensive my tiny condo was although it was "cheap" by Atlanta's standards. Without seeing the actual data, apparently even I knew a shift was occurring in Atlanta. It was the housing bubble. It is obvious now from the Case-Shiller numbers that Atlanta was leading the three with Texas in the dead rear, which lends to my friends in Dallas not losing as much value during the ensuing recession that began in 2007. In June 2006, Detroit's home valuations were finally overtaken by Dallas' increasing home values although neither had experienced their home prices appreciating like in Atlanta. Interestingly, the infamous former Detroit mayor, Kwame Kilpatrick, had just won his bid for re-election around the same time that Detroit's home valuations were beginning to decline, hmmm. On a personal note, by 2006, I had purchased 5 more units that I had planned to hold for the short-term as rentals. There was talk that the housing bubble would burst but I figured (being the savvy 20-something investor I was, cue laughter) I would either be able to sell or continue to rent my properties even when the bottom of the housing market fell out, because it was surely coming. But I, like others, did not anticipate housing values plummeting simultaneously as national financial institutions collapsed, which would spark one of the worst U.S. recessions since the freaking Great Depression. This led to my plan going up in flames since tenants were losing their jobs and not able to pay rent, AND I was not able to sell for even half of what I originally paid for the real estate rental properties. The housing values continued to plummet for Detroit and began to descend in Atlanta and Dallas in August of 2007 at an alarming rate. This time period corresponds with the documented start of the 2007 recession. Although there were fluctuations, sparks of home values increasing here and there, overall the housing values in these three cities would not bottom out and begin to consistently ascend again until February 2012. Interestingly, while single-family homeowners in Atlanta and Detroit saw their home values degrade to historic lows, Dallas residents at the worst part of the market only saw their home values depreciate to 2002 levels. Remarkably, by May 2013, Dallas' home values had already rebounded to heights experienced prior to the housing market crash. Since May 2013, Dallas single-family homes have only appreciated over the past year. Thus, my friends that moved to Dallas felt some of the tremors from the housing market crash but all-in-all had very little reduction in their home values, which did not last nearly as long as those of us that migrated to Atlanta or stayed in Detroit, since neither of those two cities have yet to recover the home value peaks of 2006 and 2007. There are many lessons to be learned but one simple one for Millennials may be don't chase the "hottest", overpriced markets. Home prices leaped in Detroit and Atlanta, sparking a wave of overpriced real estate purchases and refinances, only to crash and cause many distressed homeowners. Dallas, on the other hand, was a hot market for Millennials but was not faced with the inflated home valuations seen elsewhere. We cannot always predict when our local economy will suffer but with monthly reports like the S&P/Case-Shiller Indices, we can examine and be savvy enough to know when home values are reaching extreme levels for a given major metropolitan area. This knowledge becomes our and your power to not make the same mistakes of buying real estate that is overvalued and will one day be corrected by market forces. Whether it is the best of times or the worst of times, your first home purchase can be a good one by heeding our mistakes! If you have questions or are looking for a local agent to help you purchase or sell, we can help. Contact us at Info@AgentsAroundAtlanta.com. Here's to your success!